Price is per set. - Sold in multiples of two. This bow and arrow set includes a leather wrapped bow with two crossed arrows and a medicine bag that have been antiqued to make them look old. Crossed arrows represent friendship.The buckskin wrapped bow is approximately four feet long and is for decorational use, only. 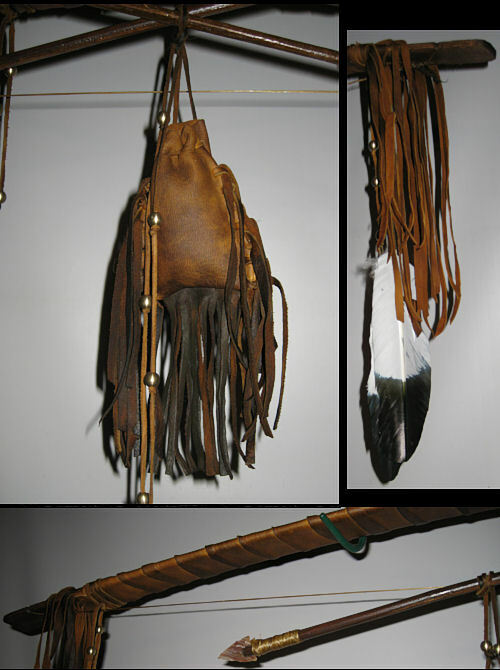 This set also includes a deerskin medicine bag with fringes that contains real wolf hair. The bow is decorated with deerskin, fringes, brass trade beads, and imitation eagle feathers. The pictures shown are representative. Because this is a one-of-a-kind hand crafted item, each may vary slightly from the one pictured. Feathers used for fletch on the arrows varies, depending on feathers we have on hand. If you prefer glass crow beads instead of brass beads, specify your color choices in the comment field of your order form.